Each month, Modern Healthcare and the ECRI Institute publish the "Technology Price Index". This publication is a resource to keep medical professionals appraised of the average cost of common items and equipment in the industry at a given time. See “Top 10 Most Expensive Capital Items – January 2013” for reference. 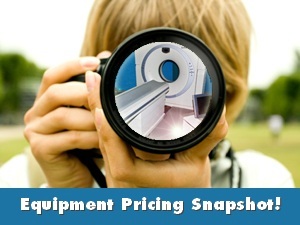 With such frequent updates on the average cost of brand-new imaging equipment, we at Block Imaging thought it was about time to fill the marketplace in on what they can expect to pay for used, refurbished imaging equipment. Below, you'll see our most popular modalities and how much our customers save on average over current brand-new pricing when they choose to "go refurbished". If you've compared the numbers, there's no doubting which route is more economical. Even with the downward creep of prices in some modalities, costs to refurbished buyers will save them 30% or more over brand-new pricing. On top of that, the pricing in the table above includes installation (a costly and complicated process Block Imaging's Project Management team manages for you) and a 1-year service contract to take care of maintenance and repairs. We don't think it's news to anyone that refurbished equipment costs less, but looking at these numbers, (and this political climate) we think the occassional reminder can't hurt. If you'd like a quote on any of the modalities mentioned above or others, contact us!